Commodity markets are dealing with unprecedented levels of disruption, including U.S. and China tariff changes. How is our partnership with Eka providing traders with the real-time tools for managing risk in commodity trading? 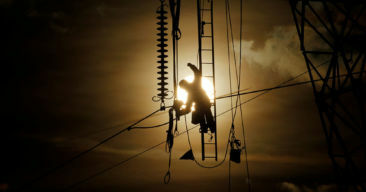 Many tools for managing risk in commodity trading are inflexible and disconnected from market data, hampering the response to rapidly changing conditions. A partnership involving Refinitiv’s high quality data and Eka’s machine learning algorithms is helping to create real-time insight, enabling customers to make better decisions. Three out of four of the world’s largest agribusinesses, several of the world’s largest natural gas companies, and the world’s largest iron ore mines run on Eka. To stay ahead in today’s market, commodity trading companies need to be flexible, smart, and able to take advantage of evolving technology to grow their businesses. Eka and Refinitiv have partnered to bring their technologies together to enable commodity trading companies to better manage risk, procurement, and finance in any market situation. 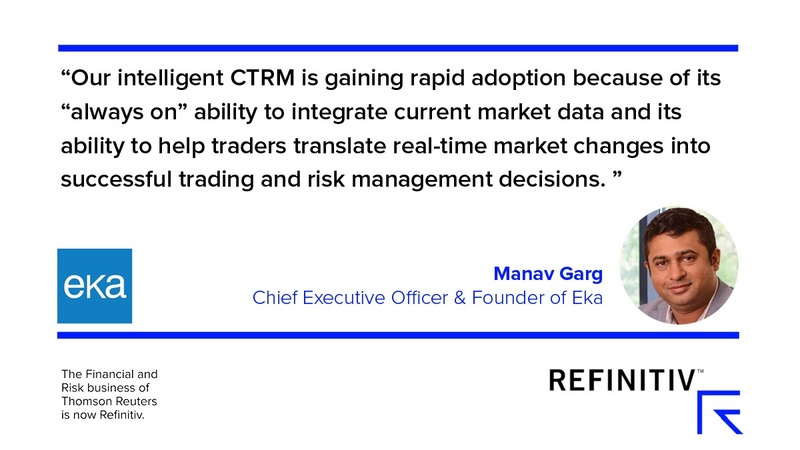 We spoke with Manav Garg, chief executive officer and founder of Eka, to learn more about the challenges facing commodity trading companies, and how Refinitiv and Eka software can provide the advanced analytics these companies need to solve challenging problems. Q. Manav, can you tell us why you founded Eka and what your journey has been like so far? I started my career as a coffee trader. My inspiration to found Eka came from the lack of user-friendly systems to help commodity companies trade and manage risk effectively. We started Eka by building a commodities trading and risk management (CTRM) system and set out to be the most in-depth solution in the market. Today, we support the work of more than 90 tier-one commodity firms around the globe. Three out of four of the world’s largest agribusinesses, several of the world’s largest natural gas companies, and the world’s largest iron ore mines run on Eka. Our apps connect workflows in every part of the commodity value chain, from trading and risk management to sourcing, supply chain, and procurement. Q. We know the commodity industry is continually changing. What is the biggest challenge commodity companies face today? Commodity markets have always been volatile, but today they face unprecedented disruption from multiple sources: extreme weather events, shifting political landscapes, and regulatory changes such as tariffs. The biggest challenge is to make timely decisions based on meaningful analysis and data. To do so, firms need to quickly and effectively respond to rapidly changing markets. They can’t spend days or weeks analyzing data while volatile markets shift positions dramatically. 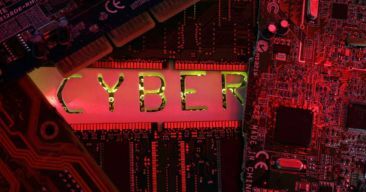 Yet the CTRM, enterprise resource planning (ERP), and financial systems they use remain inflexible and disconnected from market data, resulting in lost opportunities. Eka and Refinitiv are changing that. Q. How do you help your customers survive in these turbulent times? Our intelligent CTRM is gaining rapid adoption because of its “always-on” ability to integrate current market data and help traders translate real-time market changes into successful trading and risk management decisions. 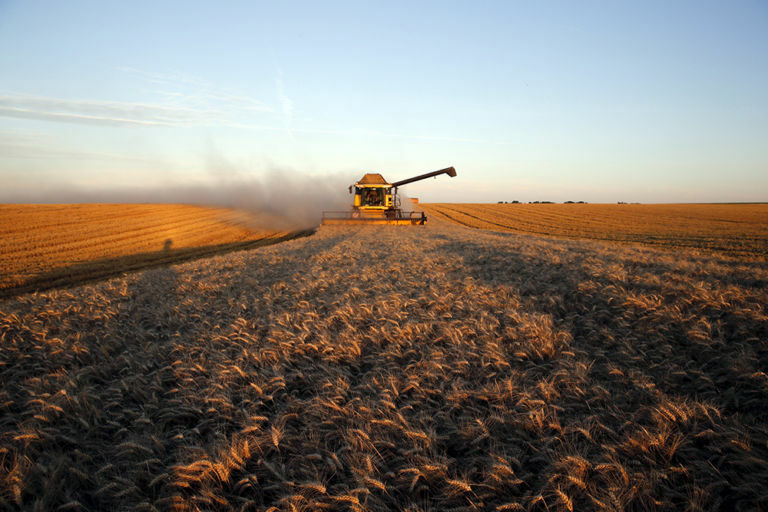 For example, if a grain tariff on China is announced, the trader receives an alert on their mobile app, prompting them to look at alternate sourcing scenarios. They open the Eka Pre Trade Analysis app, which immediately simulates the impact of sourcing from either the U.S. or Ukraine. The pre-trade analysis, position, and P&L apps are interlinked, so it is possible to easily assess the impact of the tariff. The trader sends these new scenarios via mobile chat on our platform to a counterpart in Europe and they agree to change their Chinese corn positions. This process takes less than five minutes, and would apply to other commodity markets, such as aluminum or energy. Q. What key benefits do customers stand to gain from this partnership? Refinitiv and Eka are transforming traditional CTRM systems into intelligent TRMs. The two companies worked closely over the last 18 months to integrate various data feeds from Refinitiv into Eka’s Digital App Platform, allowing our customers to access, analyze, and use data within seconds, helping them avoid the pitfalls they face if they don’t move fast. This intelligent system is configured to immediately translate data into insights, which our workflows deliver through intuitive, visual apps. Users have a single dashboard they can customize to access any data rapidly to react to market changes. These apps are meant to be ‘configured’ rather than ‘customized’ to each client, allowing firms to move from monolithic systems to intelligent TRMs within weeks. Our customers benefit tremendously by starting with the apps they need, then adding more as they scale. Q. Tell us about the critical insights Eka and Refinitiv deliver? Our combined solution gives customers real-time alerts 24 hours a day when prices reach user-defined thresholds. Users can access Eka’s Mark-to-Market app from any mobile device and analyze the potential impact of dynamic market prices on their portfolios. Customers employ Eka’s app to run value-at-risk (VaR) analyses using historical data from Refinitiv, and to create flexible VaR risk portfolios and multiple market scenarios to predict the potential impact of price shocks and ‘what-if’ trades. Our software helps companies better manage procurement by tracking market data, market news, and sentiment data. Customers receive alerts when component prices and availability may impact their portfolios. This delivers instant value to customers, enabling them to make quick decisions and cash in on market opportunities or hedge themselves from risk. Q. What are the most important things you have learned through this partnership? The biggest take away is how much value we can unlock for customers when we combine the power of Refinitv data with Eka’s digital workflows. A wealth of data is available to financial services firms, but it’s of no value unless they know how to use it. Taking days to analyze it negates the value of capturing it in real time. Refinitiv’s high-quality data and Eka’s machine learning algorithms transform real-time data into real-time insight, enabling our customers to make better decisions, reduce risk, and increase profits.